The all-new Masters Edition tournament backgammon sets from the Wycliffe Brothers® have landed, and they are spectacular! As with their Gen III predecessors, these stunning backgammon sets offer all the features found in high-end professional models at an affordable price, and are available exclusively from GammonVillage. 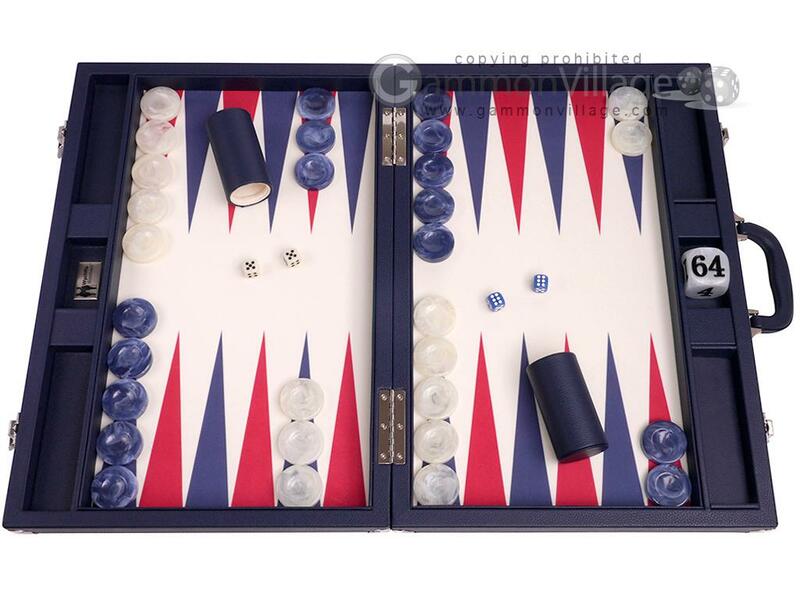 This full-size backgammon set is built around an ultra smooth playing surface, known as V-Fiber™. Similar in texture to felt or microfiber, this proprietary material was developed exclusively by the Wycliffe Brothers®, satisfying the two most important criteria for a backgammon playing surface: 1) the checkers glide effortlessly on a luxurious and perfectly smooth field, and 2) the playing surface offers the perfect amount of friction to ensure your checkers remain in place if the board is bumped or moved. You will appreciate handling the phenomenal marbleized checkers, so highly polished you'll find yourself transfixed by their beauty. Just shy of 1/2" thickness (11mm), these oversized checkers significantly reduce the instances of cocked dice, so you spend more time on game play rather than re-rolling your dice. If you're looking for heavy checkers, you've found them. Weighing in at a whopping 20 grams each, it's official - these are the new King of backgammon checkers! All Masters Edition backgammon sets come with the famous Wycliffe Brothers® oversized doubling cube, measuring 1-3/4" (42mm). When it's time to double, you can now do so with authority! Each case also features reinforced luggage-style handle and nickel plated locks. Closed Length: 21" Width: 14 1/2" Height: 3"
Page P4647 Copyright © 1999-2019 GammonVillage Inc., USA. All rights reserved.